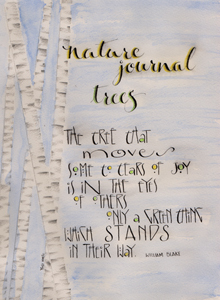 Our Guild is having an exhibit at the Fish Creek Library starting January 9th to March 16, 2012 with a "Nature/Conservation" theme. I made this piece and am quite happy with the results. It's gorgeous, Yogi! You are such an artist! I love the birch and your verse too! I LOVE< LOVE LOVE this! !